Can we go in the attic? When Amara first asked me if we could go in the attic I kind of just said no and brushed it off but she became obsessed with wanting to go in our attic. We have lived in our home for about 6 years now. I have never been in the attic and I have absolutely no desire to go in the attic. Unlike brave little Amara, Grandma Kc does not like spiders. They don’t freak me out completely but I see no real reason to seek them out. The attic is theirs. I have nothing up there. I have no reason to disturb the spiders. Amara does not see the spiders as a hindrance of any kind. Amara loves Barbie right now. Many times she has reminded me to be sure and tell everyone on her blog just how much she really loves Barbie. She was so thrilled when I kept her up to date on Ken and Barbie getting back together just before Valentine’s Day. It is funny the little things we Grandmas will do, like listen to the Ken and Barbie update on the news! 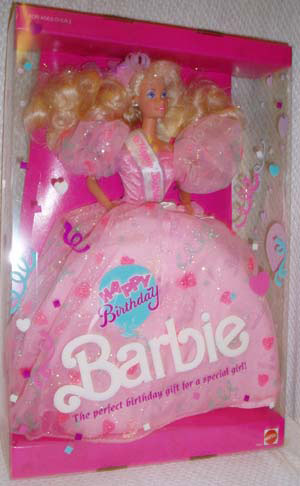 Somehow Birthday Barbie is the one Barbie that has not made it into Amara’s cherished Barbie collection and she really wants her bad. I reassured her that since none of us had been in our attic in the 6 years that we have lived here and that before that there were no Birthday Barbies that there could not possibly be one in our attic. I don’t think she believes me! This memory was posted in Indoor Fun and tagged Amara, attic, Barbie, Birthday Barbie, dolls, Grandma, Ken and Barbie, spiders on March 12, 2011 by Grandma Kc. Oh wow! I would SO put a Birthday Barbie up there — then make her grandpa take her up there to get it! As a kid, I always found attics to be fascinating places.You might find something wonderful up there! I’ve been in my current home about as long as you have been in yours, and I know what’s in my attic–boxes, extra chairs that we drag down for holidays, ditto my turkey roaster. Nothing in the least bit exciting or glamorous! Oh to be a child and have that imagination. With kids anything seems possible. This past Christmas we put our tree up when a couple of our grandkids were here for a visit. My husband took them up to the attic to help bring the decorations down and they loved it! But five years ago when my grandson was less than a year old and barely crawling, my daughter went up to their attic to put some things away. She said the little guy sat on the floor at the bottom of the ladder SCREAMING as that hole in the ceiling took his mommy out of sight. 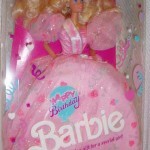 Yep, she needs to find a Birthday Barbie up there! I wouldn’t go in the attic either KC, don’t like spiders. Amara is very much like Lucy, she will pick up them up without a care in the world. Let her grandfather take her up, that way you are relieved of the duty. I would not go in the attic unless I had no other choice! Isn’t it fun to find out why kids think up stuff?